We may define augmented reality to be a real time experience of direct or indirect interaction with the environment of a physical real world that has been augmented or enhanced by the help of computer-generated details and adding them to it. AR can be viewed in 3-D real or imaginary platform of objects to interact with. Virtual reality is a somewhat difference in the sense that it performs in a virtually created environment while AR is close to the real world. Augmented reality gets us the useful information we need immediately before us. It helps in simplifying one’s life by providing a sense of reality by superimposing virtual items upon the real world in real time. These virtual items in front of you might get you some information that you cannot detect with your own senses. It helps one perform daily tasks with the help of digital information provided or just have an entertainment purpose with Wikitude or other mobile AR applications. This term well comes in existence much before “augmented reality”. Geeks who love to watch television channels like discovery and national geographic often might have experienced this technology. It simply means reality with imagination. It’s a simulation of reality in a way that it looks real but it’s not. This simulation is done in two ways. 1. The subject or person is made ready in a room with big displays on the walls, calibrated with the position of the person. This makes the person as if he’s watching a real surrounding. 2. The subject is given wearable gadgets synced with each other and allow him/her to watch an ongoing simulation (video and audio) as if he’s watching a reality. These gadgets include gloves fitted with sensors to send signals of hands and body movements to a controller which then controls the simulation. It uses computer vision rendering of 3-D virtual items from the exact viewpoint from which the shot of the real environment is being taken by the tracking cameras. This image registrations mostly use video tracking. The process works by tracking the images and then reconstructing them. Tracking makes use of edge detection, feature detection or other to recognize images. In computer vision, the available tracking techniques are of two types, feature-based and model-based methods. Feature-based discovers the connection between the 2-D image features and 3-D coordinates. The model-based method uses tracked models like 2-D templates. As the connection is made between the 2-D and 3-D frame, the 3-D pose can be made possible to project it onto the 2-D coordinates. The devices for augmented reality are input devices, tracker, computers and displays. 1. Head mounted display is a device worn on the head or as a part of a helmet and that makes user’s view of his surroundings with images of both real and virtual items. 2. Handheld displays are small devices that the user can hold in their hands and through the video-see-through technique, the user can overlay graphics onto the real surroundings and activate sensors like digital compasses, GPS and other. These displays come in the form of smartphones, PDAs and tablets which are portable and present a combination of required CPU, camera, accelerometer, compass, and GPS, all that can be used an AR display device. 3. In spatial displays, there are video projectors, optical elements, radio frequency tags, holograms and other technologies to deliver graphical information onto the physical items. Augmented reality systems are classified into five categories which are fixed indoor systems, fixed outdoor systems, mobile indoor systems, mobile outdoor systems and mobile indoor-outdoor systems. These categories allow the user for movement, not constrained within one room and move throughout the wireless system. A video on AR image recognition is embedded from TED youtube channel. 1. Commercial and Advertising – AR is mostly used by marketers to promote their products with the help of augmented 3-D item pop out or presented in their screens as a real thing so that viewers can better understand it from all angles. Marketers find this promotion as a creative idea of showcasing their products to the customers. For example, the famous car company MINI ran an augmented reality advertisement in several German automobile magazines, in which the reader simply had to go to the website of MINI where the car ad shows up as a 3-D MINI. 2. 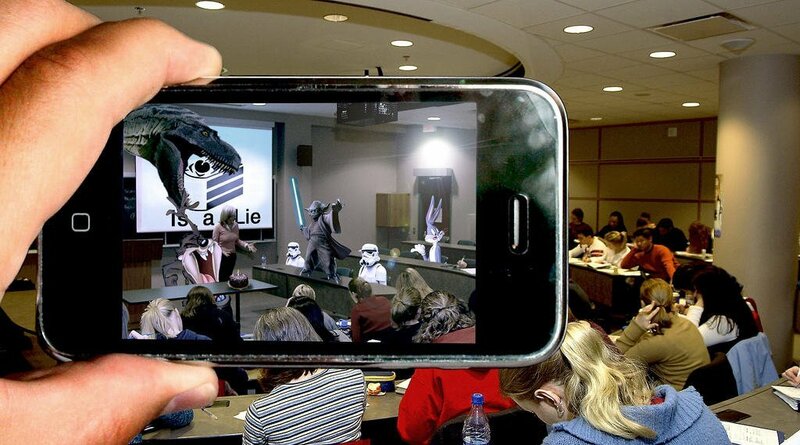 Entertainment and Education – AR is such a wide area of technology, that it covers entertainment and learning very well. There are great AR entertainment apps, AR games, and educational apps for learning in smartphones. 3. Medical applications have image guided 3-D view of the human body upon which the user can see the details and learn from it. 4. Mobile apps contain a variety of different apps that can be any augmented character on screen, 3-D navigators to find hotels, restaurants, augmented driving, space AR view, furniture arrangement apps and more like these. This article was published in Technology and tagged Augmented Reality (AR).